You need to be logged in to access the requested page. If you are a registered member, your session may have expired please visit our home page where you can log in. If you would like to register you can read more about membership below. 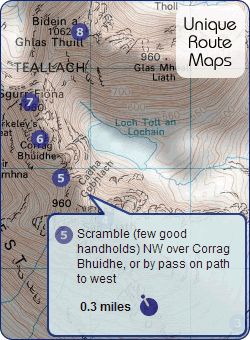 Create you own log file including dates, your notes, time taken and images of the mountains. You can also download your log to Microsoft Excel or create PDF documents which you can save locally or print. New format route information with detailed instructions including bearings, map references, descriptions and intermediate heights. These too can be saved or printed as PDF documents. Submit your pictures, comments, reviews and routes. Optionally switch off banner advertising. Customise the route times to your own pace. Whats New - easily keep in touch with updates to the site. Baggers Gallery - submit pictures of you and your friends on the summit. Forums - discuss relevant topics with like minded people. We are confident that you will enjoy the benefits of membership. Why not try it for free? We use PayPal as our online card transaction partner. They are a member of the Ebay group and have more than 100,000,000 customers worldwide. Your credit card transaction will be handled securely and safely by them and there is no need to have a PayPal account.